Almost all of us have dreamed of smart homes where our appliances do our bidding automatically. The alarm sounds and the coffee pot starts fermenting the flash you want to start your routine. Bright Lights come on as you walk through the house. Some hidden computing device responds to your voice commands to read your schedule and messages to you while you get ready, then turns on the TV news. Your car drives you to work via the least crowded route, freeing you up to get caught up on your reading or preparing for your morning meeting while in transit. We’ve read and seen such things in science fiction for a long time, but they’re now possible through IoT apps development. Because one platform that has already created the buzz and hype is IoT (Internet of Things), has brought significant changes in our lives like other technologies i.e. wireless communication, cloud-based computing system, & smart devices has taken. IoT is the hot cake in the innovation alliance nowadays. Whether we discuss Home Automation, Connected Devices, Security Systems or Controlling Systems IoT has not left any field where it has not have an effect on tasks by dropping down the operative cost and expanding the decision making and intelligence. The Internet of Things (IoT), also sometimes mentioned to as the Internet of Everything (IoE), consists of all the web-enabled devices that gather, send and act on data they obtain from their surrounding environments by means of embedded sensors, processors & communication hardware. These devices, often called “connected” or “smart” devices, can sometimes speak to other related devices, a process called machine-to-machine(M2M) communication, and act on the data they get from one another. 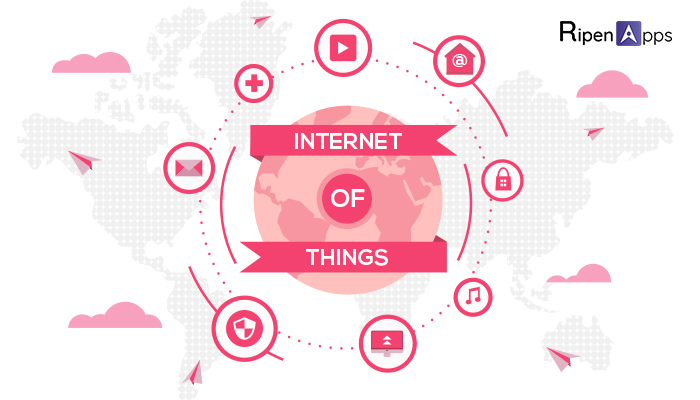 Internet of Things IoT involves a huge database that catalogs and tracks objects using few technologies. Using these wireless recognition systems and traceability, the objects can communicate data to other objects or nodes. A survey offered by BI Intelligence says that 24 billion devices will get connected to IoT by 2020, whereas $6 trillion is expected to be invested in IoT within next 5 years. IoT has essentially influenced a diverse set of industries to speak of including the healthcare sector, the entertainment, and gaming etc and Internet of Things benefits different industries in a different way through IoT app development. Network: Network performs it’s the same task of transferring information from route to the source by crossing through all the nodes of the network. It collects data from the cloud and spread it to all required nodes. Things in Themselves: The Things in Themselves performs as an Internet Gateway is regarded as an important structure that helps in other device communication via single or many communication protocols. Cloud: The Cloud is that the hub of data or server that serves as a security cover safeguarding your confidential data. At the critical time, the ordered data gets processed whereas the processing of a program occurs during the concluding stages. This could be anything whether mobile app, web app or even software those users make use of. The prior step that a developer needs to ensure is selecting the suitable platform for the IoT app development process. But yes… you must remember the fact that the chosen platform should able to support the IoT applications & its components. There is a great deal of ready to utilize IoT platforms which will assist you with developing applications all the more effectively like Ubidots, Xively or Thingworx. Internet of Things IoT is developing bigger consistently. Recently IoT has spread all over the industries and it doesn’t have limited services. Its scope has widened & extended quite a lot. Before proceeding IoT mobile app development process, it is necessary to consider the industry first. There are various industries which are optimally connected. It includes healthcare, manufacturing, transportation, sports etc. At the time of IoT app development, it is essential to keep services apart from API interfaces. Thinking why do so? Well, it is important for the app to run smoothly on the web as well as mobile & helps in acquiring effortless Internet of Things projects. Arranging IoT apps assist in providing better opportunities. To keep data protected from the hackers & unwanted theft, it is the key responsibility of the app developer & IoT app development company to provide a safe & secure environment to IoT data. The security of data becomes paramount especially in case of banking apps or GPS networks. To get an idea of apps functionality & its system, it becomes a priority to understand a different level of IoT apps. There are four layers exists in IoT apps i.e. the device, the analytics area, the ingestion tier, and end-user. So, it is significant to consider the devices which will be connected. The ingestion tier allows software to receive data as well as manage it. The analytics tier helps in the dispensation of data. The end users are measured for whom the application is developed. The IoT is always remained connected to devices and sensors. They keep communicating with the each other via a network. This differentiates them from mobile and web apps. The hardware is subjected to various security based issues especially in the firmware. So, it is vital to update firmware frequently. It should be authenticated and suitably signed before any update. To develop an IoT based apps, the app developers have to keep certain things in mind. Developers should not permit any compromise on quality & speed at any terms & cost. He has to focus on comprehending the ideas in reality and provide a stable working prototype. The IoT-based apps should be scalable. The IoT is still a new concept but it has already been expected that it has gigantic potential and will become larger than ever with the time to arrive. Scalability will allow your app to remain in limelight even after a long period of time. The IoT is as a cherry on the cake to this technological arena. Gradually it is mounting & has reached the point where accessing data & getting connected has become easier & in-budget also. The IoT app development can arrive as a challenge for the developers because of its uniqueness. It is not based on conventional methods unlike web or mobile apps. In case of any query and assistance, all you need to ping on info@ripenapps.com. Our team of tech-experts available rounds the clock at your assistance.